There have been major new developments in PPH prevention and treatment in the last decade, including technological advancements (such as inhalational oxytocin and the non-pneumatic antishock garment), new treatment strategies (such as advance distribution of prophylactic misoprostol for self-administration after birth, administration of oxytocin via Uniiject and care bundles for PPH management), as well as large multicountry trials of tranexamic acid for PPH treatment and a heat-stable formulation of carbetocin for PPH prevention.6–12 The increasing number of PPH prevention and management options makes it challenging for providers and health system stakeholders to choose where and how to invest limited resources in order to optimise health outcomes. Multiple uterotonics have been evaluated for PPH prevention over the past four decades, including oxytocin receptor agonists (oxytocin and carbetocin), prostaglandin analogues (misoprostol, sulprostone, carboprost), ergot alkaloids (such as ergometrine/methylergometrine) and combinations of these (oxytocin plus ergometrine, or oxytocin plus misoprostol). Trial evidence for each of these options has been meta-analysed through multiple separate Cochrane systematic reviews that compared one uterotonic option against several other options or placebo/no treatment. However, subtle but important methodological differences have emerged between these reviews. For example, there are differences in trial eligibility criteria, review outcomes and subgroup comparisons. Some uterotonic comparisons (eg, oxytocin vs misoprostol) appear in more than one review. Cochrane review standards have evolved over time, meaning more recent reviews may have higher methodological rigour. In December 2018, WHO issued new recommendations on uterotonics for PPH prevention (table 1).15 Oxytocin (10 IU, intravenously or intramuscularly) remains the recommended uterotonic of choice for all births. In settings where oxytocin is unavailable (or its quality cannot be guaranteed), the use of other injectable uterotonics (carbetocin, or if appropriate ergometrine/methylergometrine or oxytocin and ergometrine fixed-dose combination) or oral misoprostol is recommended for the prevention of PPH. In those settings where skilled health personnel are not present to administer injectable uterotonics, the administration of misoprostol (400 µg or 600 µg orally) by community healthcare workers and lay health workers is recommended for the prevention of PPH. The recommendations incorporated several methodological advancements compared with previous iterations. The NMA was updated (now contains 196 trials, 135 559 women) to incorporate latest evidence, including the large WHO trial of heat-stable carbetocin.11 13 This also required the application of the latest Grading of Recommendations Assessments, Development and Evaluation (GRADE) Working Group’s guidance on using NMA to a WHO guideline development process.17 18 The recommendations have placed greater emphasis on a woman-centred approach, incorporating findings from a qualitative systematic review of women’s perspectives and experiences of PPH prevention and treatment.19 This evidence proved integral to the panel’s consideration of the value women place on outcomes related to blood loss after birth, the acceptability and feasibility of different uterotonics, and their possible impacts on health equity. The recommendations were developed and released rapidly (approximately 7 months after the first publication of the NMA20) through the innovative WHO ‘living guideline’ approach to maternal and perinatal health recommendations, whereby literature surveillance and systematic prioritisation guide the updating of selected high-priority recommendations on a continuous basis.14 This approach has two major advantages—it allows WHO to respond much more quickly to important changes in the evidence base (ensuring up-to-date guidance is always available), and it significantly reduces the time and resources required for updating a guideline (by focusing efforts only on those individual recommendations where an update is warranted). As uterotonics for PPH prevention is an active research area, this new approach will allow WHO to respond rapidly as new trial evidence continues to emerge. This can in turn translate into more rapid improvements in healthcare services and health outcomes for women. In light of the updated recommendations, WHO is urging international agencies and donors, as well as professional associations, clinicians and national health systems stakeholders to reassess their national health policies and protocols on PPH prevention. Stakeholders will need to consider contextual factors (such as the availability of quality-certified medicines, and the availability and training of skilled health personnel) to determine which uterotonic option should be used (see figure 1). 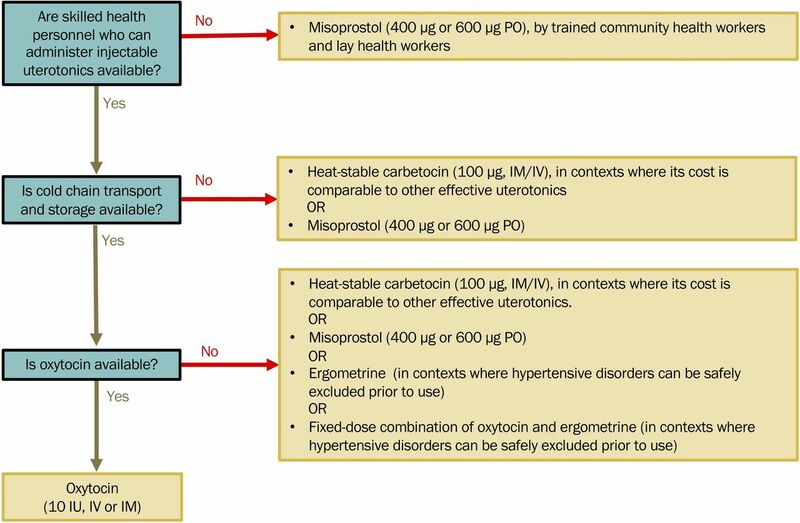 Contextual considerations in selecting a uterotonic for postpartum haemorrhage prevention (only quality-assured medicines should be used regardless of which uterotonic option is selected). IM, intramuscular; IV, intravenous. This is an opportunity to ensure that health facilities have copies of updated, evidence-based PPH prevention and treatment protocols, job aids and decision-support tools available for immediate use in labour, delivery and postpartum areas. Any facility where women give birth requires access to a functioning supply chain, in order to ensure 24/7 availability of uterotonics for PPH prevention, as well as the necessary medicines and equipment to provide emergency obstetric care should PPH occur. Skilled heath personnel require competency-based in-service training, as well as ongoing supportive supervision to ensure their PPH prevention and management skills are up to date. Health facilities and clinicians can also take this opportunity to review their PPH prevention, treatment and case fatality reduction targets, and ensure that a data-driven approach is being taken to drive improvements in care at the time of childbirth. Quality improvement activities need to engage all key stakeholders, including clinicians, programme management and quality improvement staff. Criterion-based audits of clinical records can be used to assess the effectiveness of prevention and management of PPH at a health facility level. Oxytocin, ergometrine and the fixed-dose combination of oxytocin and ergometrine are heat-sensitive, requiring transport and storage at 2°C–8°C. In settings where this cannot be guaranteed, the quality and effectiveness of these options may be limited.21 Substandard quality misoprostol has also been identified in some health facilities.22 A quality issue affecting one uterotonic may suggest that there are quality issues affecting other uterotonic options that have been procured, transported or stored under similar conditions. It is therefore advised that only quality-certified uterotonic medicines should be procured. While some manufacturer labelling may seem to indicate that oxytocin is stable at room temperature, stability may not have been tested in the much warmer conditions that are typical to many low-resource countries, and different formulations have different stability characteristics. To prevent its degradation and to safeguard its quality, oxytocin should always be stored in refrigeration, regardless of labelling. The majority of PPH-related morbidity and mortality are preventable through the effective implementation of evidence-based guidelines. These new WHO recommendations guide skilled health personnel and other stakeholders on how best to use uterotonics to prevent PPH in women giving birth in facility or community settings in high-income, middle-income or low-income countries. To implement these recommendations, personnel need effective, quality-certified uterotonics, and the necessary training, equipment and support to ensure that all women have access to good-quality PPH prevention and management care at birth.
. WHO recommendations for the prevention and treatment of postpartum haemorrhage. Geneva: World Health Organization, 2012.
. Safe motherhood Initiative: maternal safety bundle for obstetric haemorrhage, 2015.
. WHO recommendations: Uterotonics for the prevention of postpartum haemorrhage; 2018.
. British National formulary 72 (September 2016-March 2017). London, United Kingdom, 2017.
. Views and experiences of women and healthcare providers on interventions for the prevention and treatment of postpartum haemorrhage: a qualitative systematic review (protocol). PROSPERO2018.
. Survey of the quality of medicines identified by the United Nations Commission on life saving commodities for women and children. Geneva: World Health Organization, 2015. Contributors This article was conceived by JPV and OTO. All authors (JPV, MW, IG, FA and OTO) contributed to the development and finalisation of the article.